I was delighted to be asked by the folks at The Charleston Wine and Food Festival to participate in a food blog event and contest called Lambs + Clams. This event will promote the annual festival while celebrating the purveyors and farmers who supply their products to the Charleston region. Four monthly recipe contests will be held in the lead up to the festival which opens February 28, 2013. Each contest will spotlight either lamb, clams or oysters supplied by Craig Rogers of Border Springs Farm and Travis Croxton of Rappahannock River Oysters, both of whom provide their quality products to top chefs and restaurants all over the Eastern seaboard. I am flattered and honored to be selected to compete with 7 talented food bloggers (listed below) from around the country in this event. By now you should know I love a good challenge, so I did not hesitate to accept. Let the games begin! 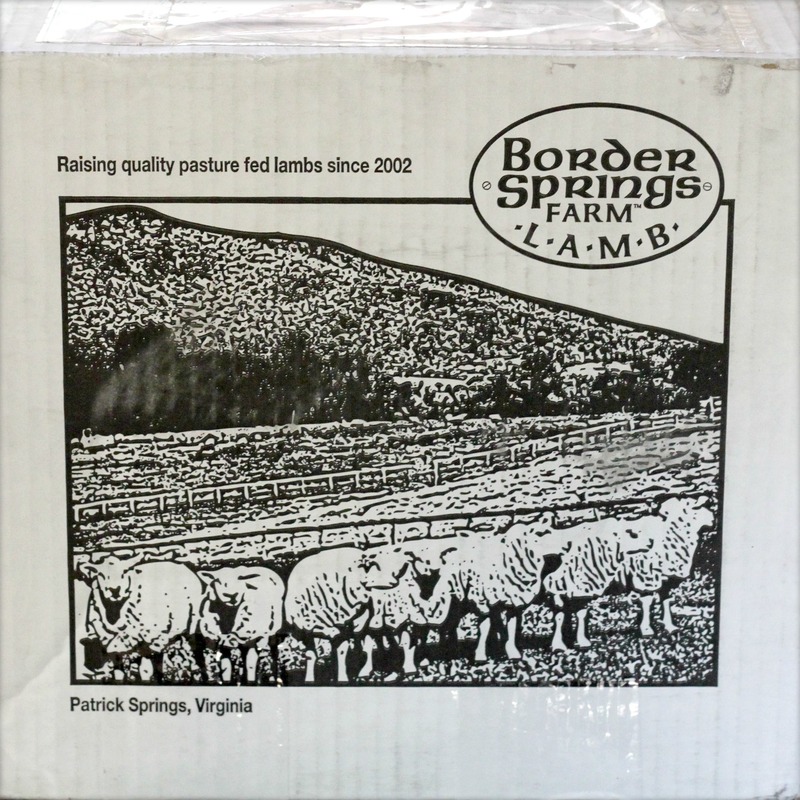 This month the contest kicks off with a challenge to create a recipe for a leg of lamb from Border Springs Farm. You can imagine how excited I was to receive my lamb – the anticipation felt like Christmas. It arrived in a BIG box, and I eagerly unpacked a gorgeous, glistening boneless leg of lamb weighing in at 5.4 pounds. Christmas came early this year. I love to travel, and when I am not traveling, I bring my bucket list of destinations home to my kitchen for cooking inspiration. With that motivation, I decided to create a lamb recipe fragrant with the heat and spice of northern Africa and made a thick fiery marinade heady with Mediterranean spices, garlic, lemon and mint. One deep whiff made my fingers and toes tingle and transported me to Morocco, the sands of the sahara and an aromatic souk. It was all I could do to keep from slurping it up with a spoon. I smeared and massaged the lamb with the marinade – yes, that’s right: massaging helps to work the spices into the meat. I could also just say “work the marinade into the meat with your fingers” but massage sounds so much nicer. Then came the hardest part – waiting. The longer the wait, the better. The lamb should marinate overnight, or even for 2 days if you can stand it. (When time is truly an issue, 8 hours will do, but overnight is best). Once you’ve mastered the waiting part, the recipe is very easy to prepare, and the results are outstanding, yielding a succulent, exotically aromatic leg of lamb with a subtle kick of heat. To serve the lamb, I roasted an assortment of late summer vegetables (chinese eggplant, sweet peppers, onions and zucchini) with olive oil, garlic and salt and scattered them around the meat. There was plenty to share, so a few friends joined us as well, and we all enjoyed this wonderful pre-Christmas gift of lamb. Ground cumin and coriander may be substituted for the seeds, however the flavor is best if you toast and grind your own seeds. Serves 6 to 8. Prepare the marinade: Toast cumin and coriander seeds in a skillet over medium heat until fragrant, about 1 minute. Transfer to a mortar with pestle and grind to a fine powder. Transfer to a medium bowl. 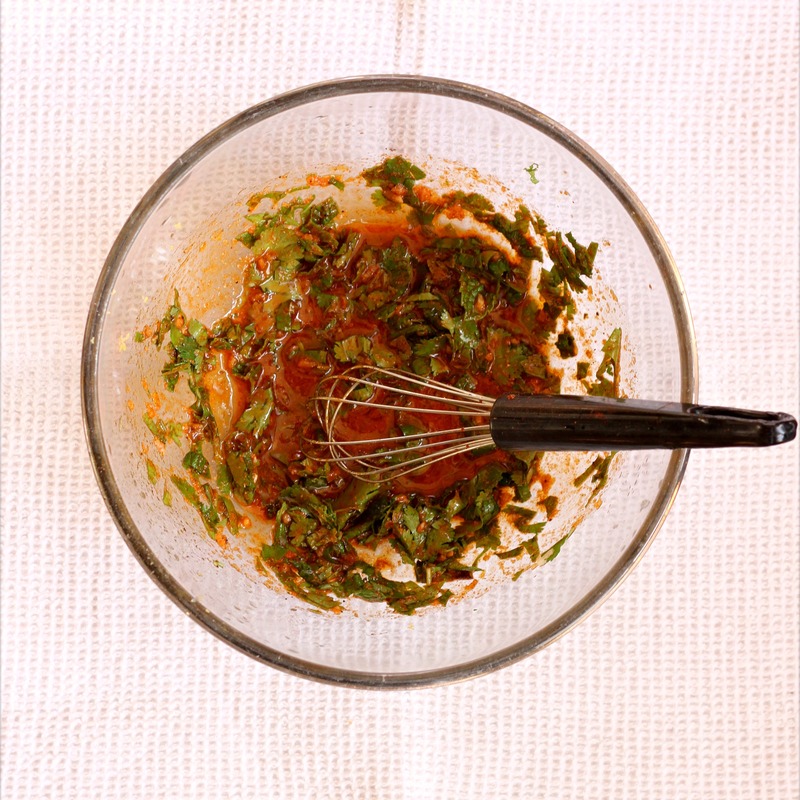 Add remaining marinade ingredients and whisk to blend. Make small incisions in the fat and meat of the lamb. Rub the marinade all over the lamb, massaging it into the meat and folds with your fingers. Place lamb in a rimmed baking dish. Cover tightly with plastic wrap and refrigerate overnight. 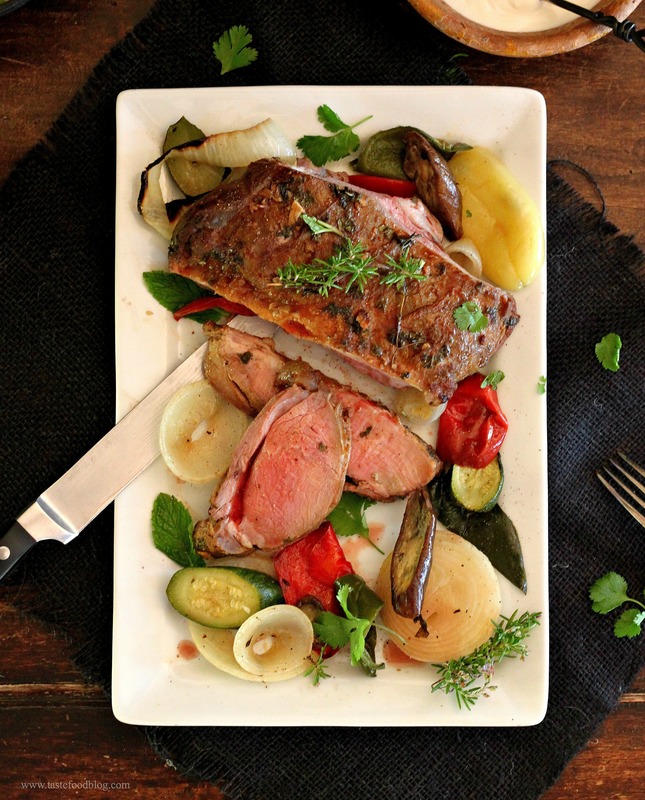 One hour before roasting, remove the lamb from the refrigerator and let stand at room temperature. If grilling, prepare the grill for direct and indirect cooking over medium heat. Grill the lamb for 10 minutes over direct heat to sear, skin-side down, turning once. Move to indirect heat and grill, covered, turning once or twice, until medium-rare (a meat thermometer inserted in thickest part will read 130 F), 20 to 30 minutes. If roasting, place lamb in a roasting pan. Roast in a preheated 425 F. oven, skin-side up, for about 30 minutes for medium-rare, turning once. Finish under a broiler, skin side up, for a few minutes to brown meat. Allow lamb to rest for 10 minutes, loosely covered with foil, before carving. To make the yogurt sauce, whisk all of the ingredients together in a small bowl. Arrange the lamb on a serving platter. If you roasted vegetables, scatter them around the lamb. Garnish with fresh herbs. Serve with the yogurt sauce. 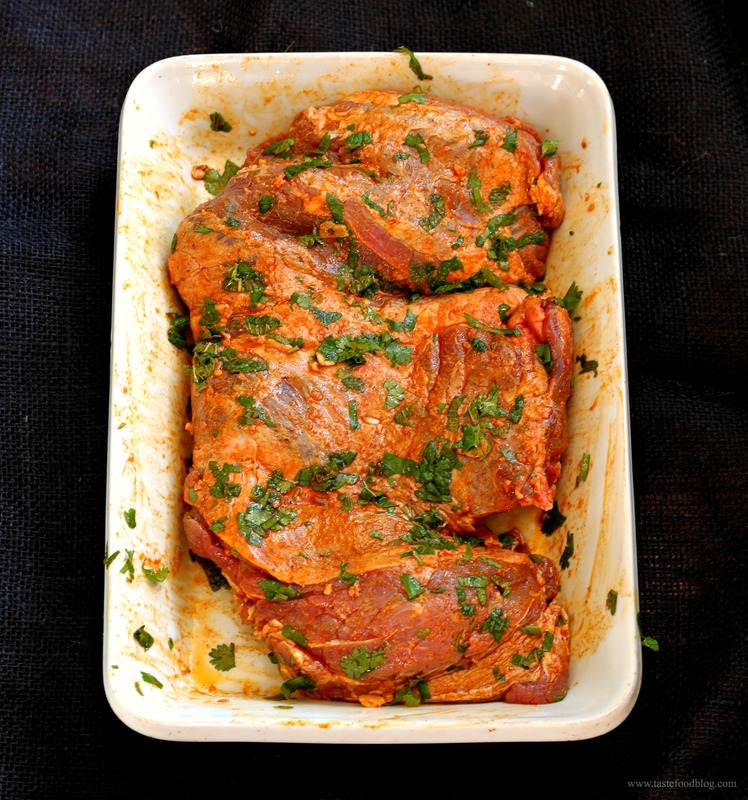 I love any kind of harissa marinade with lamb – the two are perfectly well matched. You are totally the marinade Queen – I love all the ingredients you chose. Good luck on the contest – let the games begin indeed!!! Beautiful! A refined way of preapring lamb. Really scrumptious looking. What a simply beautiful dish! Lamb is such a treat, and here you have done it total justice. 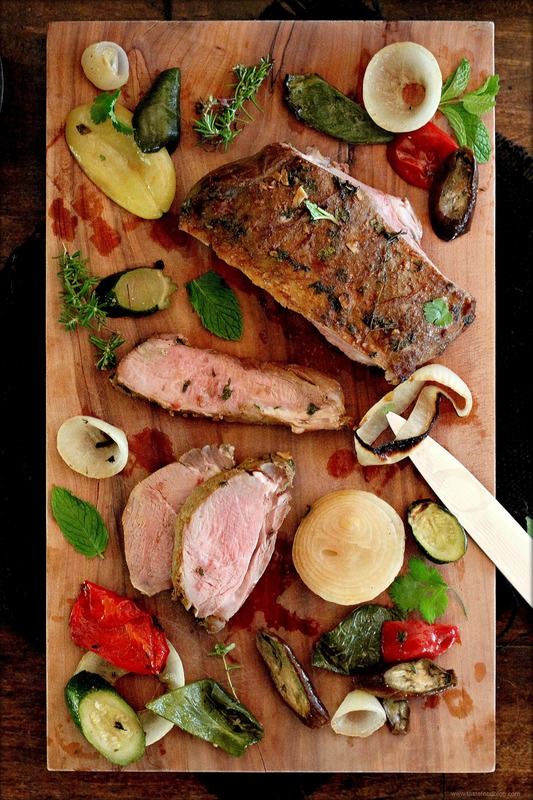 Beautifully cooked and seasoned and paired with simple, vibrant sides….what a feast! Love that openning shot Lynda! Congrats on being part of the comp and good luck, though I’m sure your creations will be top notch! Looks beautiful Lynda!! I love the harissa. I can almost taste it. Best of luck to you!! Thank you, Heather. The best of luck to you too! This looks amazing ! Congrats. on the contest and best of luck! !